OK, this is one for next weekend (unless you happen to be home midweek, five hours before dinner needs to be served). I’ve blogged a close relative of the recipe before, but this is a new, improved version with a better photo. The potatoes are obviously not low-carb, but are there to keep the Sprogs amused. I would normally serve this dish with rocket leaves, but I had a lettuce in the fridge that needed consuming. I roasted two lamb shoulders so I’d have Monday-night leftovers. METHOD: Preheat oven to 120C. Pour stock and wine into a large casserole with tight-fitting lid. Add lamb. Bake for 5 hours. Rest, covered, while baking potatoes (see TIP). Shred meat off the bone with 2 forks onto a serving plate. FETA DRESSING: Fry garlic slices and lemon rind in olive oil in a small pan. Add chopped olives, lemon juice and crumbled fetta. Warm for 1 minute. Pour over lamb. TIP: Chop potatoes into roasting pieces. Microwave them with a splash of water for 4-5 minutes to soften. Dry with a tea towel. Toss in oil. When lamb is removed from oven, increase temperature to 200C. Arrange potatoes on a sheet of baking paper on a baking tray. Bake until golden. 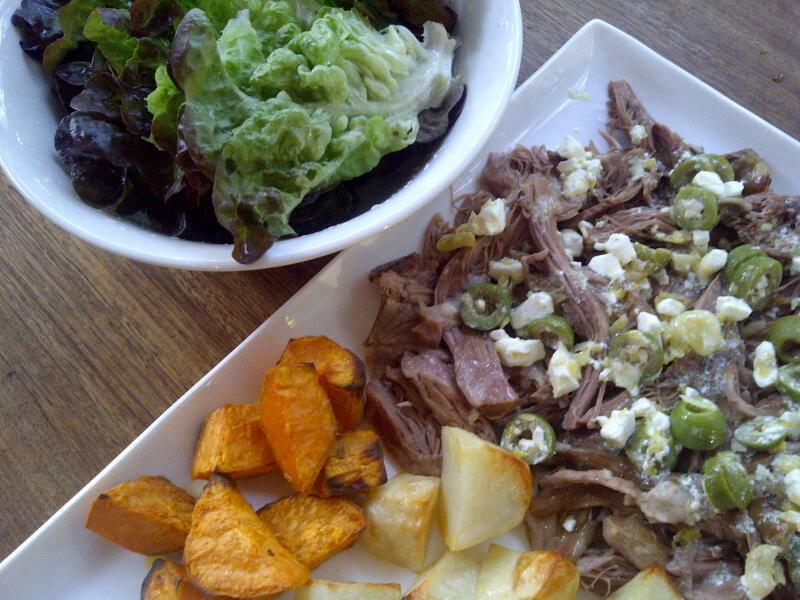 Serve lamb and potatoes with something green, such as rocket. Really? No way! How can that be? ?